Harmony Hollow owner Bradley Cross welcomes you to the beauty of wind made visible. A slight breeze spins these all-copper designs providing a mind entrancing, mesmerizing visual pattern. The eye follows the triple helix design as it rotates in a peaceful clockwise direction providing a very relaxing, meditative state of mind. The Orbiters use the above designs as the core, and around them spins a copper orbiting oval with twin struts going counter-clockwise. The eye follows the directional flow both up and down, as well as clockwise and counter-clockwise creating a truly captivating sensual, hypnotic mindscape. This design also illustrates the synergy of the partnership of opposites. Fast service. 1-2 day shipping, overnight available. Most are in stock year-round. You get a free extra copper hook which is large enough to hang a spinner from a tree branch as well as a brass 10" extender hook to drop it through foliage or hang from a porch ceiling, only from Harmony Hollow. Care and maintenance sheet with detailed information, only from Harmony Hollow. Special horizontal Flagpole available with fiberglass pole and screweye for secure presentation anywhere, only from Harmony Hollow. NEW! Glass Globe Spinner Hangers: Click for more information. Horizontal Fiberglass Flagpole - Click the picture for more information. 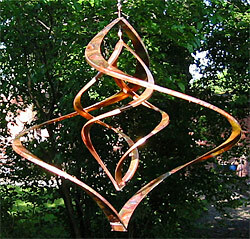 These range from 12" to 38"
These range from 8" to 25"
These range from 16" to 24"
These range from 12" to 18"
These range from 18" to 34"
These range from 14" to 26"
These kinetic sculptures are made of pure copper and can be outside year round. Like all copper, they will mature from shiny to light brown, dark brown, light green, and finally after years, to a dark green like a copper roof. The ball bearing swivel provides an almost frictionless support durable for years of enjoyment outdoors. Hand made in the USA.